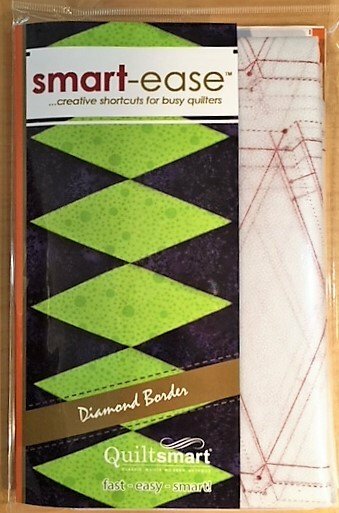 Diamond Border is a perfect addition to your quilt and SO EASY! A fabulous border for going around our popular 38" and 58" Lone Stars! METHOD: "Flip & Stitch" - this is EASY! Just fuse, stitch, and flip for perfect matching diamonds! WOW - 2.5" strip friendly! Use our Diamond Fussy-Cut Template to easily center and position your fabric with fussy prints or stripes. This template is also great for cutting the rectangles from the 2.5" strips! Comes in a 6" x 9" pack with 2 panels of interfacing & instructions to make a total of 4.5 yards of approximately 5.25" wide finished border. PEEK DOWN (Scroll) below the video to see SUGGESTED PRODUCTS! For a free quide for combining the border with the 58" Star, see "Sel's Star" shown in video below (border around 58" Lone Star) and found under our "FREE Downloads" turquiose button on Home page. 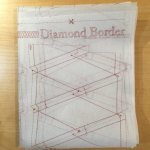 For that specific border design, you will need 4 panels total Diamond Border, so first-timers will need 1 pack and 2 panels. Lone Star panels and packs sold separately.